Students discussed MIT's investments in companies doing business in South Africa, the Sullivan principles, and the effectiveness of divestment at a forum on apartheid and divestment held in the Baker House dining hall Thursday. About 35 people from the MIT community discussed the issues at the first in a series of meetings sponsored by the Undergraduate Association (UA) Council. "The council every month is having a forum on a campus issue," said UA President Bryan Moser '87. The issue of apartheid and divestment was chosen for the first forum as a "precursor to the Institute Colloquium," he said. 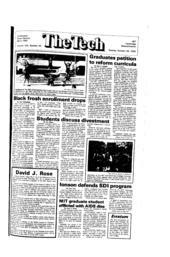 Several documents were handed out at the forum, including a fact sheet on South Africa, copies of two articles from The Tech concerning MIT and divestment, a questionnaire on apartheid drafted by the UA Council and a recent copy of The Student with an anti-apartheid button. It was impossible to find a South African student who would talk about the apartheid issue, according to Lori Avirett '87, one of the organizers of the forum. South Africans who speak against apartheid while outside of their country "can be charged with treason when they return" she said." MIT currently has $150 million of a total of $800 million invested in securities linked to businesses dealing with South Africa, Moser said. "There is a financial case that can be made" for divestment, according to one student. The International Monetary Fund and US banks have already stopped making new loans to South Africa, he said. Some students at the forum opposed divestment. "What right do we have to interfere in other countries' internal affairs?" asked one student. "I'm not sure this is the right means for expressing disagreement," said another. Students expressed differing opinions on the purpose of divestment. The purpose of divestment is to weaken companies, rendering them "not strong enough to pay taxes in South Africa," said one student. Another said it was to make the cost of doing business in South Africa more than the profit. Divestment is an expression of "international solidarity" with blacks in South Africa, said Arnold Contreras '84, a member of The Student. One student said, "This is one step along the path to hopefully equal rights in South Africa." Another student noted that Columbia University was "saying the same thing as Paul Gray was saying" not long ago, but agreed to divest within two years because of student pressure. Several students criticized the Sullivan principles, a set of guidelines for companies doing business in South Africa. "A lot of people believe this is to provide good publicity for companies." said one student, criticizing the Sullivan principles. "As long as companies are in South Africa, they pay taxes and support the government." Another student said that the South African government reserves the right to take over corporations' facilities in that country during times of civil unrest. The South African government has endorsed the Sullivan principles, said Omar S. Valerio '85, a member of the MIT Coalition Against Apartheid. Valerio noted that the there is no neutral third party evaluation of company compliance; rather, "companies check up on themselves." Leon Sullivan, chairman of General Motors, said "the Sullivan Principles are no longer working," and supports "divestment as an ultimatum," according to another student. Moser raised the issue of why attention has been focused on South Africa instead of other oppressive countries. He noted that South Africa was the only country to base its oppression "solely on the basis of race." Contreras said that it was "hypocritical" to only consider corporations' actions toward South Africa while ignoring their activities in other countries. "It's important to look at their role all over." Moser also questioned: "How does the apartheid issue affect us at home?" The Institute is "returning back to the middle 50s," said Contreras, citing the firing of Dean Mary Hope, the recent assignment of the Office of Minority Education to the Office of the Dean for Student Affairs and rises in the cost of education. Those cost increases make it "virtually impossible for poor kids to go to school here today." Another student criticized proposals for tuition tax credits as "supporting private education instead of improving public education." Associate Professor of Mathematics Frank E. Morgan '74, chairman of the Institute Colloquium Committee, discussed the upcoming program on apartheid and divestment sponsored by the committee. "Is this the way to get students and faculty together?" he asked. One student criticized the scheduling of some activities during the late afternoon, which conflicted with their classes. Morgan replied that holding the activities at a later time would discourage faculty participation. "It will be interesting to see how the [student/faculty mix] will change from late afternoon to evening," he said. Contreras questioned the underlying purpose of the colloquium, citing a recent meeting in Washington, DC, in which school administrators discussed how to stop campus demonstrations. "I don't think I could be chairman of the Institute Colloquium Committee if I was a member of the administration," Morgan replied. The next UA Council forum will be Nov. 14, Moser said. The discussion topic has not been decided yet, but "educational policy" is a possibility, he said.